Follow directional signage to the Tower. The main entrance is a five minute walk from the station. Pick up point: Please take your voucher/confirmation to the Group Ticket Window along with photo ID for fast entrance to Tower of London. Important info: Audio Guides are available in English, French, German, Italian, Spanish, Dutch, Portuguese, Japanese, Korean, Mandarin and Russian. Groups of 15+ can pre-order guides for collection from the Groups Entrance at a discounted price of £3 per person. Guides can be booked on towergroups@accoustguide.co.ukAgents bringing child students or children to the palaces must provide a ratio of 1 adult for up to maximum 15 child/students children. If bringing children and students booked through the Learning and Engagement department the ration must be 1 adult to 60 children or 1 adult to 10 students. Not meeting the maximum ratio will result in the party not being granted to access on arrival. 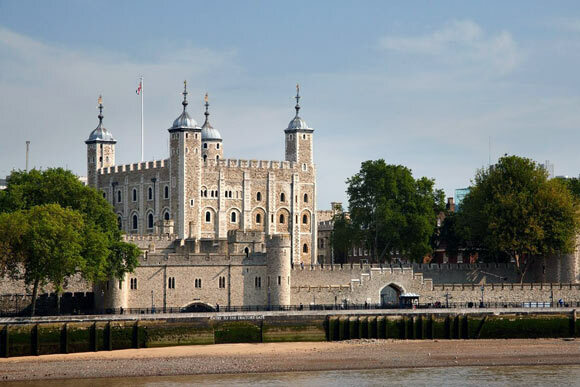 Most famous for housing the Crown Jewels which are still used by the monarchy and feature some of the most stunning diamonds in the world, the tower also offers an insight in to the lives of England's early rulers. Another well-known draw are the Yeoman Warders commonly referred to as 'Beefeaters' who initially were charged with the welfare of the prisoners and guarding the crown jewels now they fascinate visitors with the sometimes bloody history of the Tower. Another famous attraction are the ravens which, according to legend, safe guard the kingdom, there are six official ravens which have one wing clipped to ensure their presence and are looked after by the Ravenmaster. With a range of hotels within easy walking distance Hotel Direct's packages include accommodation and entry to the tower allowing visitors to make the most of their time in the capital. Founded in 1066 as part of the Norman conquest of England the Tower of London is located on the north banks of the River Thames, originally built as a symbol of oppression it was firstly a royal residence before being used to house prisoners from 1100AD onwards. Separated from the City of London by the space known as Tower Hill, the Tower is a complex of several buildings surrounded by two defensive walls and a moat. As a prison, the Tower held many well-known and dangerous criminals the most famous of which were Elizabeth I who was held there before her ascension to the throne and the Kray twins who were among the last people held there. The Tower is supposedly haunted by a number of ghosts including a grizzly bear that was once part of the menagerie kept at the Tower. One of the resident Ravens was dismissed from his duties for eating television aerials.